Properties of current console in ConEmu. ConEmu is an excellent terminal application for Windows. It can be used to host many consoles. But, changing the foreground and background colors of the console is a bit messy. Consoles on Windows can pick from 16 predefined colors. If you wish to change the foreground or background color to one of these predefined colors, then doing it is straightforward. Press on the ConEmu icon in the titlebar and choose Debug → Properties. 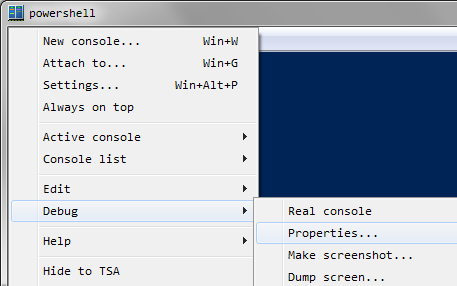 If you are running CMD.exe or PowerShell, this will bring up the familiar Windows console properties dialog. You can pick the foreground or background color you want in the Colors tab here. However, if you want to set some non-predefined RGB value as foreground or background color, you need a bit of workaround. Press on the ConEmu icon in the titlebar and choose Settings. Go to the Color section and pick some numbered color and change its RGB value to the one you desire. After that, press on the ConEmu icon in the titlebar and choose Debug → Properties. If you are running CMD.exe or PowerShell, this will bring up the familiar Windows console properties dialog. Here, the color you set earlier should be visible in the 16-color picker. Pick it as foreground or background color and it will be applied. Update: Changing colors in recent versions of ConEmu is straightforward. Please see the comment by Maximus5 below. Starting with build 120702 there is an option in “Colors” page to choose default Text/Back colors. Maximus5: Thanks for adding this feature to ConEmu. I have updated the post to reflect this change.